The new Vredestein Quatrac Pro takes center stage at its product launch event in Baden-Baden, Germany. At a former U.S. military base in Baden-Baden, Germany, Apollo Vredestein showcased its latest achievement in the all-weather UHP product segment, the Vredestein Quatrac Pro. Global industry media and key customers were invited to the event March 22 to learn more about the innovations, and to test the performance characteristics on wet, dry and ice conditions. Following the track testing was an opportunity to take the tires for a road test. 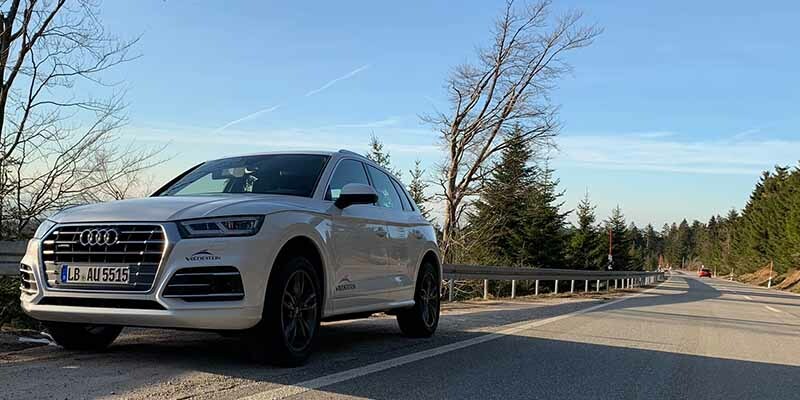 Driving an Audi Q5 Quattro fitted with the new Quatrac Pro, GPS coordinates directed participants out on the open road. From the winding climb up the mountainous elevations, through the Black Forest, to a short dash on the autobahn, drivers had the opportunity to efficiently experience the gamut of tire performance conditions in a short afternoon. Testing the new Quatrac Pro high in the Black Forest in Germany. 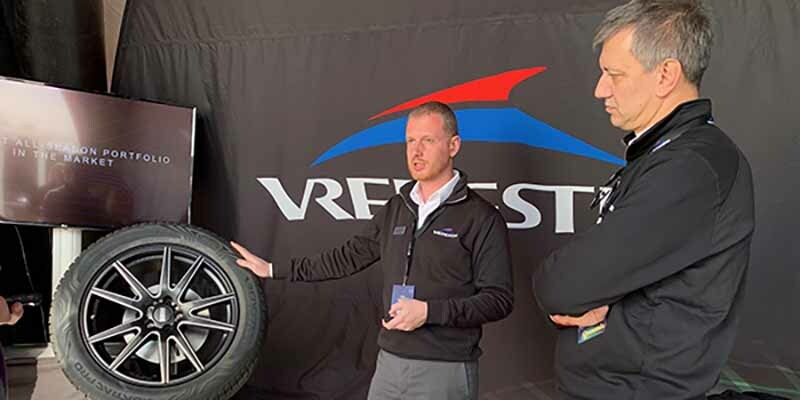 The new tire further strengthens the company’s offering in the all-weather segment and the first all-weather offering specifically designed for the ultra-high-performance vehicles, including luxury SUVs. The Quatrac Pro, designed in partnership with Italdesign Giugiaro, replaces the Quatrac 5 and boasts a variety of improvements over its predecessor. That includes over 10% better grip on wet surfaces, 5% in snow handling, improved handling and a design that offers a sense of confidence and predictability for owners and drivers of performance cars and SUVs. 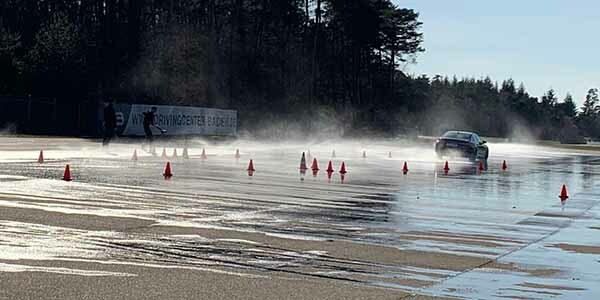 Wet testing and ice testing were performed on a special test track in Germany. The surface of the track featured a unique coating that was extremely slippery when wet, simulating the conditions on ice. The Quatrac Pro is offered in 50 sizes, with 29 of which with the Y-speed rating (speeds up to 300 km/h), ranging from 17- to 21-inch rim diameters and is available April 1, 2019. Fourteen sizes will be unique in the all-weather segment, including the 315/35 R20 fitted on a BMW X5 (rear wheel). 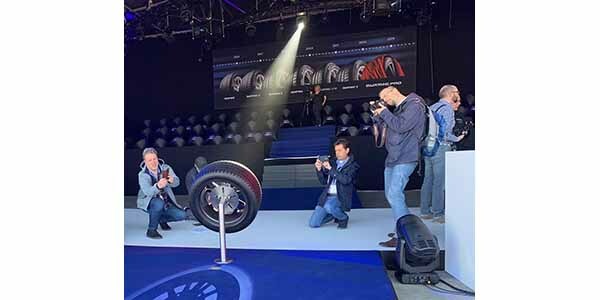 Product Manager Michele Sala shares details of the Quatrac Pro’s new design, as Daniele Lorenzetti (right), chief technology officer with Apollo Tyres Ltd., looks on.